BEIT LAHIYA, Northern Gaza Strip, (IPS) – Extensive damage to Gaza’s environment as a result of the Israeli blockade and its devastating military campaign against the coastal territory during last year’s war from July to August, is negatively affecting the health of Gazans, especially their food security. “We were living on bread and tea and my five children were badly malnourished as my husband and I couldn’t afford proper food,” Safa Subha, 37, from Beit Lahiya told IPS. “My children were suffering from liver problems, anemia and weak bones. It was only after I received regular food vouchers from Oxfam and was able to purchase eggs and yoghurt that my children are now healthier. “But it is still a struggle as I have to ration out the food and my doctor has warned me to keep giving the children these foods to prevent the malnutrition returning,” said Safa. According to the U.N. Office for the Coordination of Humanitarian Affairs (OCHA), in several communities, lack of dietary diversity was highlighted as an issue of concern, particularly for children and pregnant and lactating women, due to the lack of large-scale food assistance programs and the high prices of fresh food and red meat. Before the war, Safa’s husband Ashraf worked as a farmer, renting a piece of land on which he grew produce that he then sold. “My husband used to earn about NIS 300 per week (about 75 dollars) from farming. 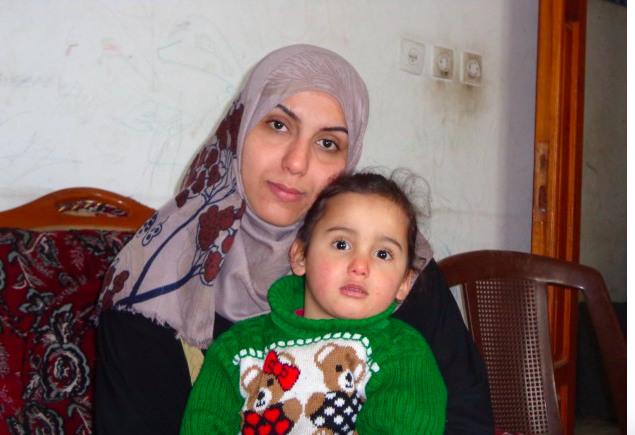 After the land became too dangerous to farm, because of Israeli military fire and much of it destroyed in Israeli bombings, my husband tried to earn some money renting a taxi,” said Safa. However, Ashraf’s attempts to support his family as a taxi driver did not provide sufficient income for their survival. “He can only use the taxi a couple of days a week because it doesn’t belong to him and he often doesn’t have money to buy fuel because it is so expensive and Israel only allows limited amounts of fuel into Gaza because of the blockade,” said Safa. Kamal Kassam, 43, from Beit Hanoun, in the northern Gaza Strip, has had to rely on Oxfam’s Cash for Work program to support his wife and five children aged 6 to 12. During the war the Kassam’s had to flee to a U.N. shelter after the family home was destroyed by Israeli bombs, which also wounded his wife and left one of his daughters severely traumatized, suffering from epilepsy and soiling herself at night. Kassam’s wife Eman is ill and another daughter needs regular medical treatment for cancer. The Kassams were provided with a temporary tin caravan to live in by aid organizations but were unable to purchase food or school clothes because they had received housing aid and were therefore “less desperate”. “I used to work in a factory but lost that job after Israel’s blockade. Before the war I made about NIS 30 (about 7.50 dollars) a day by picking up and delivering goods from my donkey cart,” Kassam told IPS. But during a night of heavy aerial bombardment, a bomb killed his donkey and destroyed the cart as well as his only way of supporting his family. Israel’s extensive bombing campaign during the war also destroyed or damaged, infrastructure, including Gaza’s sole power plant and water sanitation projects. As a result, untreated sewage is pumped out to sea and then floods back into Gaza’s underground water system, contaminating drinking water and crops and leading to outbreaks of disease. Israeli restrictions on imports, including vital spare parts for the repair of sewerage infrastructure and agricultural equipment such as fertilizer and seedlings, has limited crop production. Furthermore, the regular targeting of fishermen and farmers, trying to access their land and Gaza’s fishing shoals in Israel’s Access Restricted Areas (ARAs), by Israeli security forces has severely hindered the ability of Gazans to earn a living from farming and fishing. Food insecurity in Gaza is not caused by lack of food on the market alone. It is also a crisis of economic access to food because most Gazans cannot afford to buy sufficient quantities of quality food. “As a result of the lack of economic access to food due to high unemployment and low wages, the majority of the population in Gaza has been pushed into poverty and food insecurity, with no other choice but to rely heavily on assistance to cover their essential needs,” said ‘GAZA Detailed Needs Assessment (DNA) and Recovery Framework: Social Protection Sub-Sector’, a report by the World Bank, European Union, United Nations and the Government of Palestine. “The repetition of one harsh economic shock after the other has resulted in an erosion of household coping strategies, with 89 percent of households resorting to negative coping mechanisms to meet their food needs (half report purchasing lower quality food and a third have reduced the number of daily meals),” said the DNA report, adding that the situation was expected to worsen in 2015.